In the spring of 2012, after obtaining her undergraduate degree in biology from Bowdoin College and her Master’s Degree from Columbia University working with sea turtles, Kalyn Bickerman-Martens sought out a new adventure in order to earn her PhD. Having no prior experience working with insects at all, let alone bumblebees, Bickerman-Martens accepted a fellowship from the University of Maine, where she would be conducting research and looking at the health of Maine’s native bumblebee species, specifically in blueberry fields. 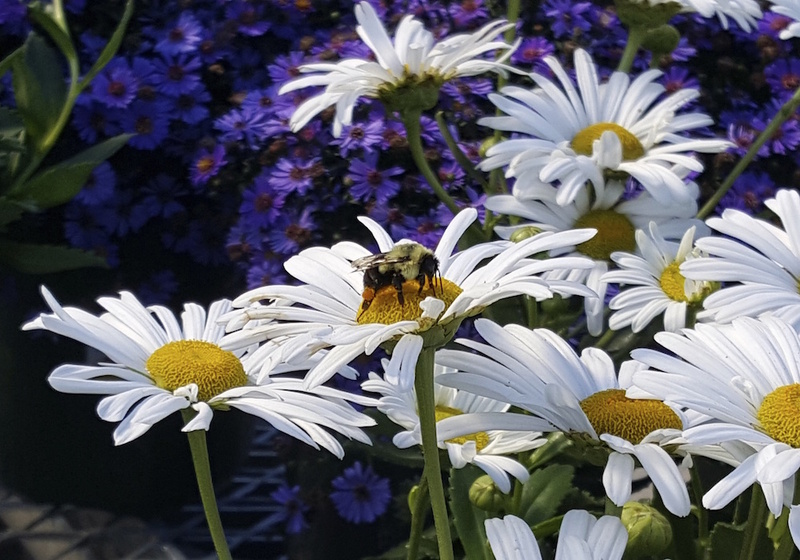 Historically, Maine has 17 native bumblebee species. While some of these species are doing really well and increasing in relative abundance, there is a fair number of species that are consistently declining and rapidly disappearing from our environment. Of the 17 native species, the yellow banded bumblebee (Bombus terricola) and the rusty patched bumblebee (Bombus affinis) are the two best known examples of declining species in Maine as of right now. While there could be a number of reasons as to why the state of Maine is losing these little creatures that are such vital parts of our ecosystem, Bickerman-Martens has chosen to focus on three: parasites, pathogens, and pesticides and their possible role in the decline of some bumblebee species. 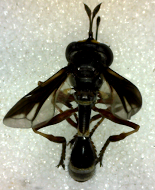 A typical day in the lab finds Bickerman opening up a dead bee to look for conopid: a bumblebee fly parasitoid. 70% of the bees they catch in the wild are infected with a fly parasitoid, which has proven to be more common during certain times of the year than others. The typical lifespan of a bumblebee in the wild is only about 2-3 weeks, therefore the conopid does not have a major effect on the bee’s lifespan, but they do harm the individual bees and their colonies in other, less obvious ways. When a bumblebee is infected with this fly parasitoid, they become lethargic, slow, and lose their keen abilities for identifying flowers. As a result they are often found wandering outside of their hive at night, either because they feel sick, are lost, or have been expelled. Furthermore, as part of the pollination process, the bumblebees fill a crop sitting in their abdomen with nectar to bring back for the colony, but if there is a larvae growing and pressing against the crop, they cannot fill it, and thus become inefficient. When the conopid is about to pupate and emerge from the bee, the bumble bee can be found crawling around aimlessly on the ground. As Bickerman-Martens made clear, this parasite and the corresponding behaviors could potentially be affecting on the reproduction rates of the colonies. In the end the fitness of a colony is measured by how many queens they produced, and if the number is declining, the health of the colony is rapidly diminishing as well. 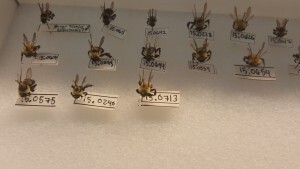 Of the many experiments organized to assist in the research and exploration of bumblebees, one sticks out to Bickerman-Martens as a very memorable experiment, and she conducted it last year on the conopid flies. While mentoring a high school student who has been working with her for a few years, and after reading a paper written in Virginia about determining the exact identification of the fly parasitoid, the two of them conducted an experiment that consisted of letting bees die naturally and recording whether or not they were more likely to die above or below the soil during the process. The thinking was that this might indicate whether they were infected with the conopid or not. Bickerman-Martens and her student discovered that it was indeed more likely for bees infected by the parasitoid to dig themselves a hole than the uninfected bees, as they are accustomed to doing for increasing their chances of survival in the winter. After the bees had died, they opened them up to look for fly pupae inside and hoped to aid in the identification of the fly by rearing the pupa to adult. 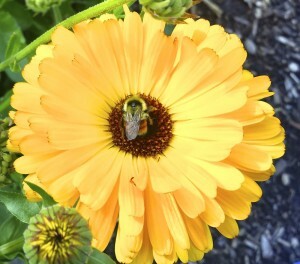 As another grand part of the ongoing and variable project, Bickerman-Martens has been working with the Maine Bumble Bee Atlas and Maine Fisheries and Wildlife in order to train citizen scientists who will go out into the field to collect bumblebees through the season and throughout the state. By gathering a very large sample size and then observing and recording where these different species are located, they are able to determine preferable habitats, geographic locations, and how these factors affect general health and life expectancy, thus providing further insight on the problematic decline. Although bumblebees are fairly small creatures, there are still quite a few distinctive features that allow for their identification. The abdomen on the dorsal side of the bee is divided into strips, which can be distinctively colored, however bumblebees are variable in color and often even look different from their colony mates in terms of color. Some more reliable methods might include: observing the length of the face, location of ocelli on the face, and the color of the hair on the face and on the thorax in between the wings under the microscope. Either way, identification is sometimes a tedious undergoing and requires quite a bit of practice and skillful observation. Often you really only have the colors to go by and the general size of the insect in order to identify it. 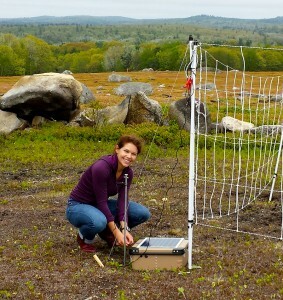 Bickerman-Martens does not know for sure when she will have completed her work here at the University of Maine, but she does know that the presence of bumblebees in our ecosystem is vital. Without bumblebees, we will lose our critical native pollinators and be unable to ensure that the pollination of crop plants takes place. Through outreach, continuous experimentation, and passionate dedication, the project will continue to make great advances in the years to come.